A week and a half in, and I’m still using my bullet journal every day. I think I just really like using my colored pens (so much, in fact, that I bought even more pretty pens (Staedtler Color Pen Set of 36 Assorted Colors), that just arrived ten minutes ago). For my first week, I tried setting up my dailies in advance, three days per page. That totally didn’t work, when my Tuesday went out of control and I ran out of space for all the stuff happening that day. This week, I started with a weekly summary on one page, to show the main things I had to remember for the coming week, and my dailies I’m doing per day, so I have the space I need, or can move stuff up when a day (like yesterday) is actually pretty non-eventful. I also have a post-it for the main items I need to keep in mind for next week (like WonderCon), and one for the main items for next month (like taxes and the L.A. Yarn Crawl). Page lives on last page of journal. Also, I’m a bit OCD and couldn’t bear the thought of mixing notes and lists with my dailies, weeklies and monthlies, so I put all the non-linear stuff–lists, trackers, notes, etc.–in the back of the notebook, with negative page numbers. So far it’s working out quite well. Lives on page -10, starting from the back of the journal. 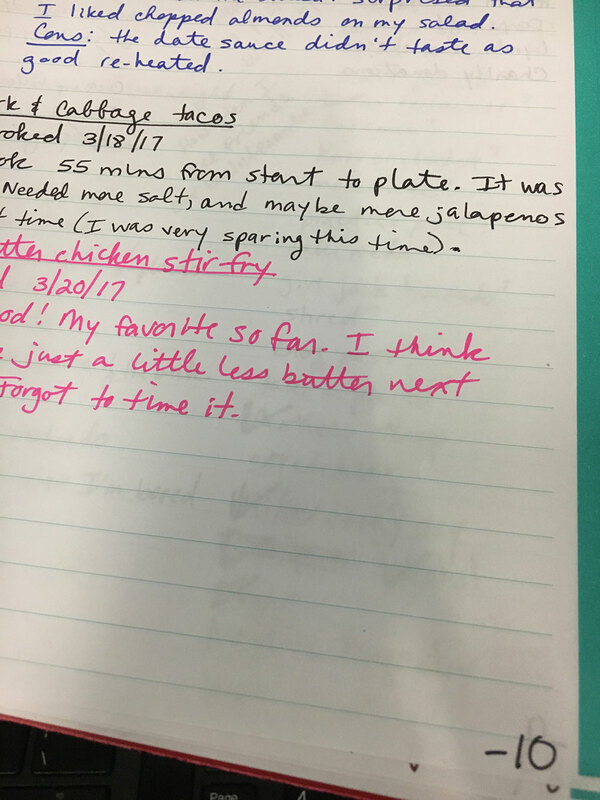 Contains my notes on each Blue Apron meal I’ve cooked this week (my first week). And I keep googling “things to track” and reading other people’s ideas for lists and such, because, as I said before, I like using my pens and want more reasons to write with them. 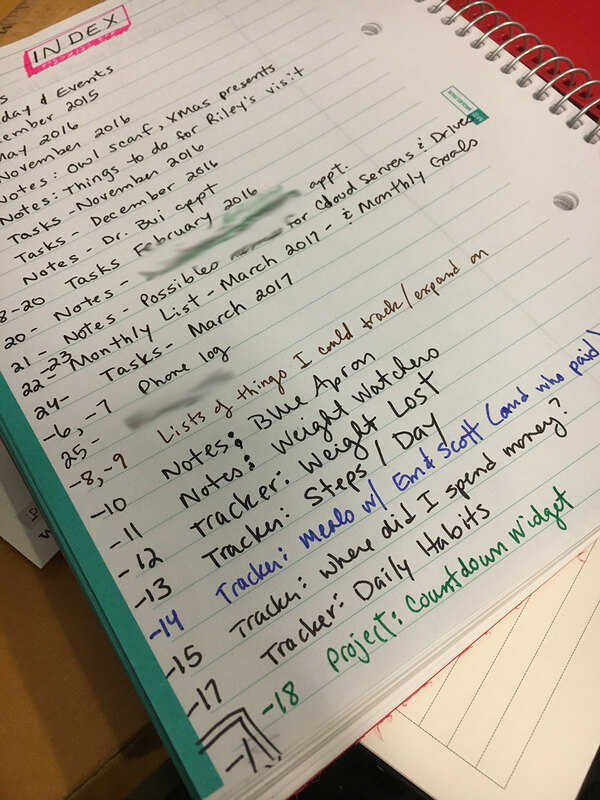 I have a “list of things I could be tracking”, a phone log, daily habit tracker, weight loss and steps/day trackers, list of reasons why I want to lose weight, where I’m spending money and when, etc. I’ve always loved notebooks and have a ton of them, but I’ve always had trouble actually filling them with anything. This time I’m determined to fill every page until my chronological stuff and my non-linear stuff eventually meet somewhere in the middle. In fact, I think I’ll write them down as my goal for 2017.